SUCCESS is the Best Revenge - Gold Medal Career Management is a very timely book for the brave new world where the alternatives are: find another job, start your own business or live eternally on welfare. Between them, the authors have over 50 years of human resource experience and both are still active in this area. John Stewardson manages a small group of contract executives and Bob Evans specializes in senior executive outplacement and career planning. They have their fingers on the pulse of the job market when they say: "Stable, lifetime employment with a single company, though it's not yet quite extinct in North America, is certainly on the endangered species list." They back this up by pointing out that over 3 million people have been laid off by Fortune 500 companies in the past 10 years and millions more with smaller companies met the same fate. Every year almost one person in four changes jobs and the average person can expect to hold seven jobs during their career. These depressing facts demonstrate that the nineties are indeed nasty, as companies restructure to meet the competitive challenges of the new global economy. So, whether you already have a job or are looking for one, it's comforting to find a book that's full of practical, down-to-earth advice to show you how to win at the new career game. In 277 pages, this new book covers the special issues that arise for those who are fired, with or without warning, and the defensive strategies they need to adopt. It examines the discontinuity and confusion being fired inevitably creates and provides practical steps to escape the mess. It discusses legal and financial issues and how to avoid the worst effects of stress. It covers career planning; exercises and advice on thinking through your options efficiently and making intelligent choices. It describes an effective job search from resume preparation and network building, to handling interviews and negotiating the job offer. From all their years of hiring and firing employees, together with placing executives, the authors know only too well that stress and revenge can also play an ugly role. They believe that defining your career goals and attaining them is an utmost priority: "Success is not only the best revenge, it's the best way to put your life back on track and reduce stress to manageable levels". "Success is the Best Revenge - Gold Medal Career Management" is a very timely book for the brave new world where the alternatives are: find another job, start your own business or live eternally on welfare. It's your career repair kit and shows you how to survive the nasty nineties. Written by two leading authorities, it is full of practical, down-to-earth advice to show you how to win at the career game. It is essential reading - whether you already have a job or are looking for one. After close to twenty five years as a human resources executive John recently became one of two founders of The Osborne Group, a team of contract operating executives. During the time he spent in human resources, he was involved in all aspects of the field. In the process of hiring many hundred people over the years, he' s conducted literally thousands of interviews. He's also been involved in over a hundred terminations. And for people between the two ends of the employment process, he's done both individual and group career counselling. Bob's career, also near twenty five years long, has been spent in executive search and outplacement. He's one of the founding partners of Evans, Duff & Associates, a Toronto firm specializing in senior executive outplacement and career planning. His experience with hundreds of executives who've been terminated and had to face the problem of restarting their careers over the last dozen years and, earlier in his career, with conducting hundreds of searches as a management consultant uniquely qualify him to provide both insights and ideas relevant to career transitions. Introduction - This book...what it's about and how to use it..
Chapter 8 - You've got an offer...hallelujah! Chapter 13 - Self defence...where will all the money come from? 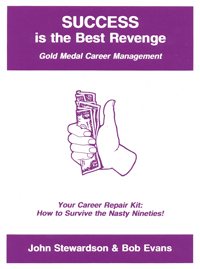 SUCCESS is the Best Revenge: Gold Medal Career Management: by John Stewardson and Bob Evans; 277 pages, softcover, ISBN 978-0-920847-88-6; published in 1994; Canadian $39.95.